Offering you a complete choice of products which include Conventional Fire Alarm and Addressable Fire Alarm. We have come up with high-tech Conventional Fire Alarm (AD-101) which is highly sensitive towards heat and smoke. 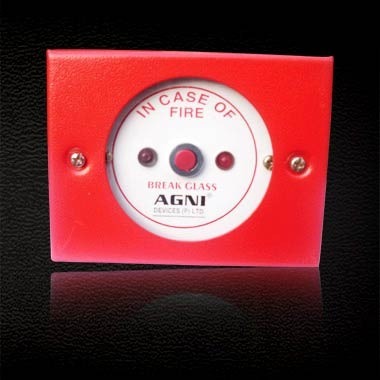 This Conventional Fire Alarm works on the traditional principle and is prompt in alerting about any break of fire. The Manual Call Point of this Conventional Fire Alarm is tough, durable & highly visible. An Alarm LED/s is provided inside the call point to indicate the condition of the alarm. The Electronic sounder is designed for use within fire alarm systems, security systems and industrial signaling systems. We present special Conventional Fire Alarm (AD-301MR). This Conventional Fire Alarm is designed in a way so that alarm signal can be actually transmitted to all the locations. This Conventional Fire Alarm works specially for the close room. We present cutting-edge Addressable Fire Alarm (XP95). The Addressable Fire Alarm that we offer comes from the reliable manufacturers in the market and is extremely reliable. This Addressable Fire Alarm has various features that make it demanded in the market. Easy to install, our Addressable Fire Alarm never fail to give accurate warning about fire. Our Addressable Fire Alarm (XP95) is tough, durable and highly visible. A single alarm LED is provided on the call point. This LED is controlled, independently of the call point, by the control and indicating equipment (CIE). The call point’s address is set at the commissioning stage by means of a seven-segment DIL switch. Call points can be remotely tested from the CIE by transmission of a single bit in the communications protocol. Call points respond by providing a value of 64 which corresponds to the alarm value. The CIE should recognize this response as a test signal and should not raise a general alarm. We present Addressable Fire Alarm (XFP 1-2 Loop) which comes from leading brands. This Addressable Fire Alarm is extremely sophisticated and provides accurate fire alert. Made from high quality components, this Addressable Fire Alarm is resistant to damage caused by heat and moisture and is durable in nature. Full compatibility with the Context Plus XP95 range of smoke and heat detectors, call points, sounders and control modules. We are the prominent Addressable Fire Alarm (Fireplus 4-32 Loop) Exporter, Importer and Supplier in Meerut, Uttar Pradesh. This Addressable Fire Alarm is procured from the trusted vendors who manufacture it with the use of cutting edge technology. Our Addressable Fire Alarm gives accurate warning about the fire. This Addressable Fire Alarm comes with certain features that make it efficient equipment against sudden fire broke-out. The Conventional Fire Alarm (AD-502) is designed for use within fire alarm systems, security systems and industrial signaling systems. In this Conventional Fire Alarm combined sounder and beacon gives an audio-visual warning which is appropriate for place requiring high sound output and visual indication. The Oriel series of Microprocessor based fire alarm panel is an upgraded version which provides a reliable and cost effective solution to fire detection, from small to large size installations which have 2, 4, 6, 8 & could go up to 60 zones of selecting models and features. This Conventional Fire Alarm (Oriel Series) has been designed to give high standards of performance, reliability and quality. This Conventional Fire Alarm (Oriel Series) complies with IS 2189: 1999 and is tested by the ERTL (N). This Microprocessor based Conventional Fire Alarm (Orion Series) provides a reliable and cost effective answer to fire detection. Our Conventional Fire Alarm is available from small to large size installations starting from 2, 4, 6, 8 to 60 zones of selecting models and features. This Conventional Fire Alarm offer high standards of performance, quality and reliability and complies with IS 2189: 1999. This Conventional Fire Alarm is tested by the ERTL (N). The Conventional Fire Alarm is specially suited for the small offices, workplaces, small & high rise buildings.